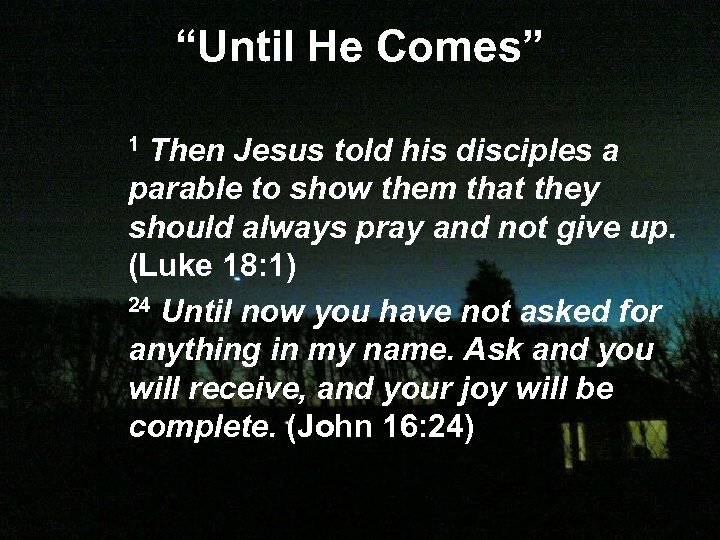 “Until He Comes” 5 May the Lord direct your hearts into God’s love and Christ’s perseverance. 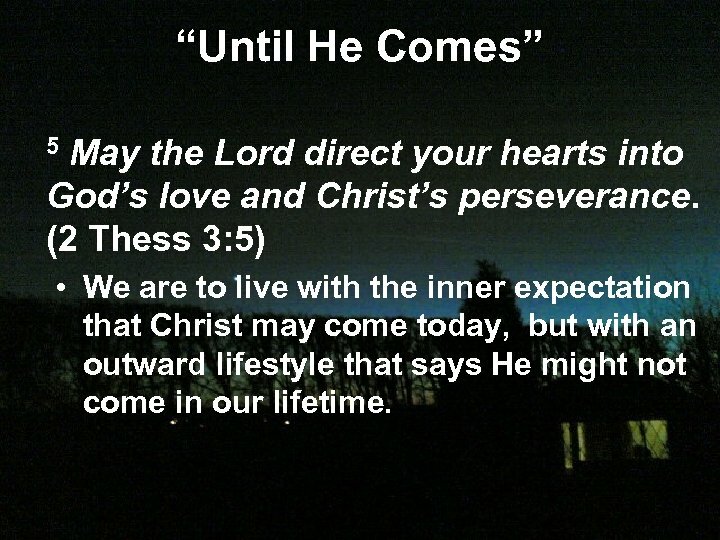 (2 Thess 3: 5) • We are to live with the inner expectation that Christ may come today, but with an outward lifestyle that says He might not come in our lifetime. 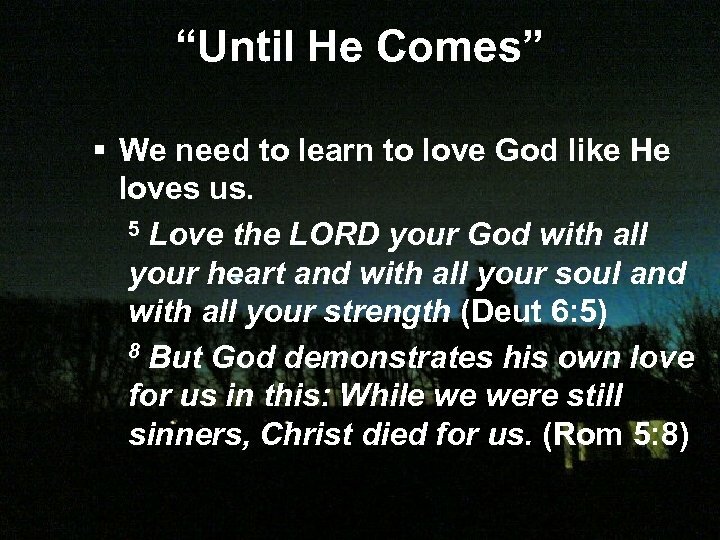 “Until He Comes” • In other words, we are to work like He is coming back in the next 5 minutes, while realizing that He may choose to wait until after our lives are over. 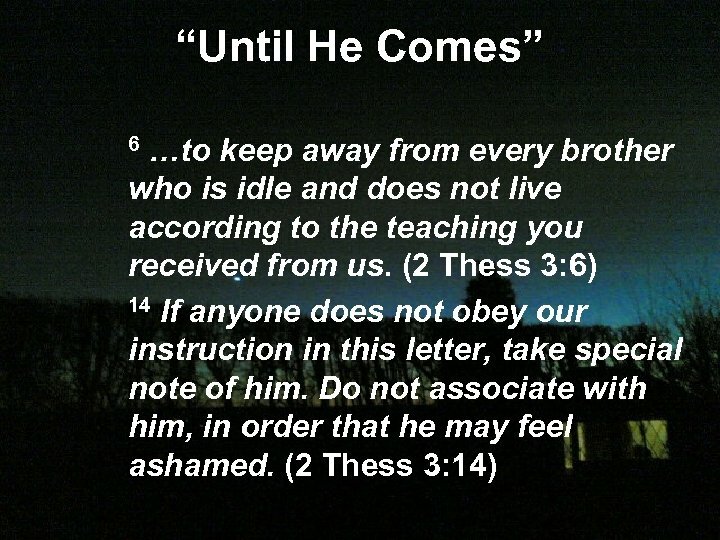 • Paul wrote 1 Thessalonians to comfort the church about the imminent return of Christ. 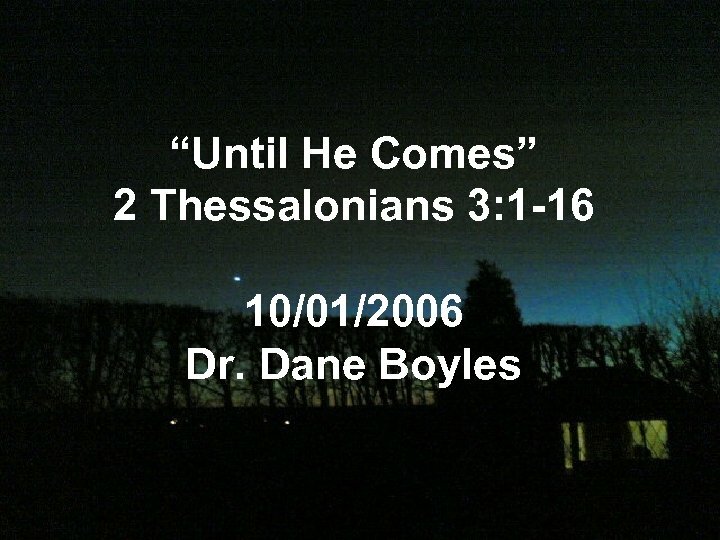 “Until He Comes” • Paul wrote 2 Thessalonians to correct an error in thinking about the imminent return of Christ. 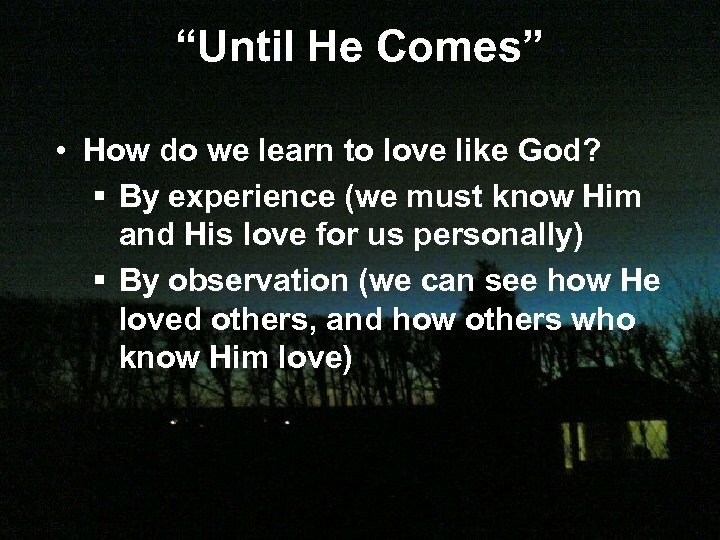 • How do we do this? 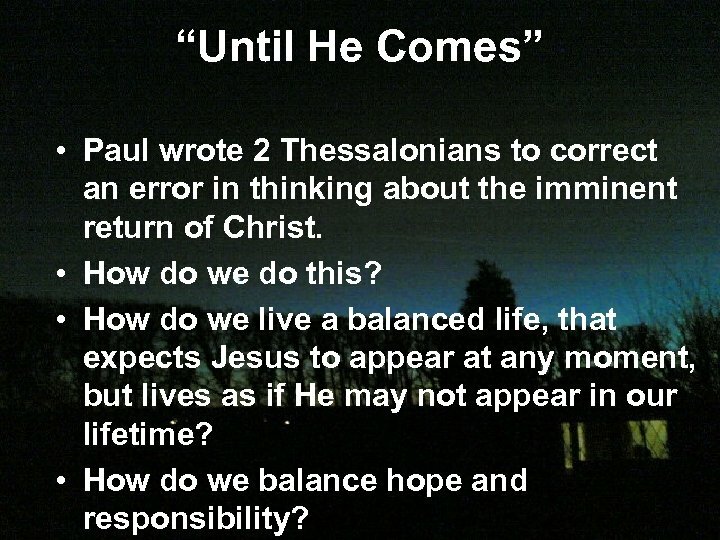 • How do we live a balanced life, that expects Jesus to appear at any moment, but lives as if He may not appear in our lifetime? 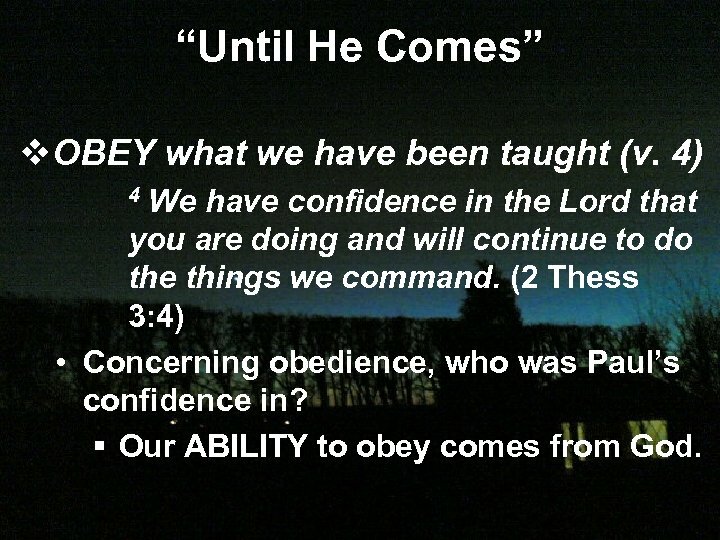 • How do we balance hope and responsibility? 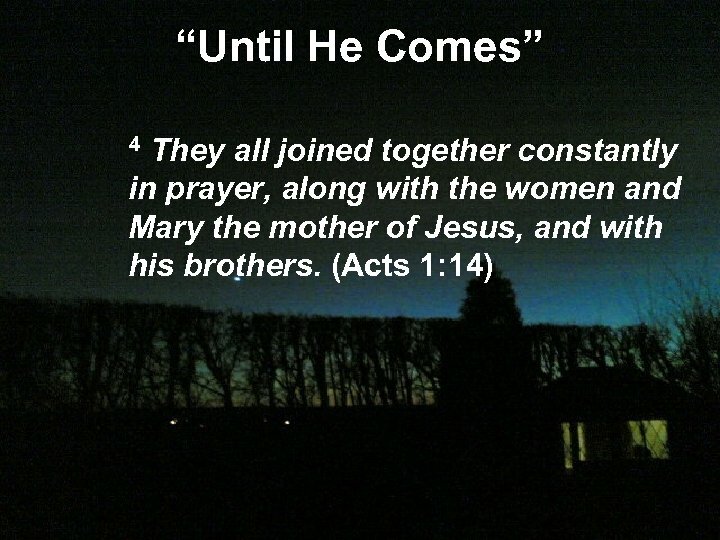 “Until He Comes” • • Pray for us. 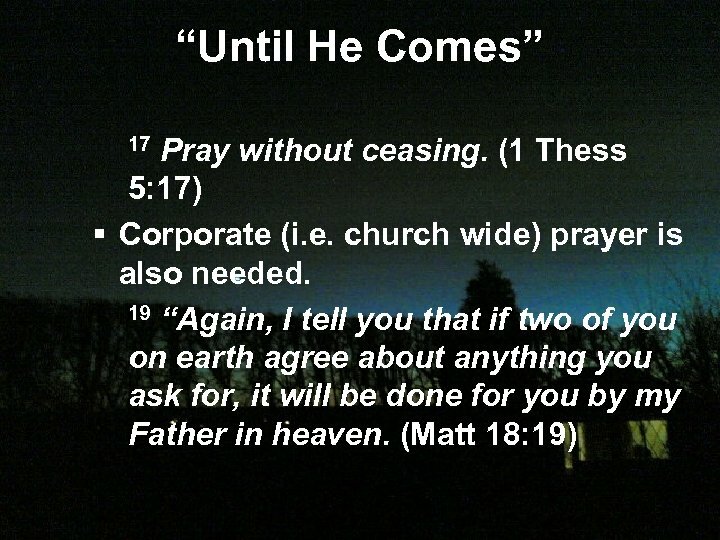 Pray for the spread of the gospel. 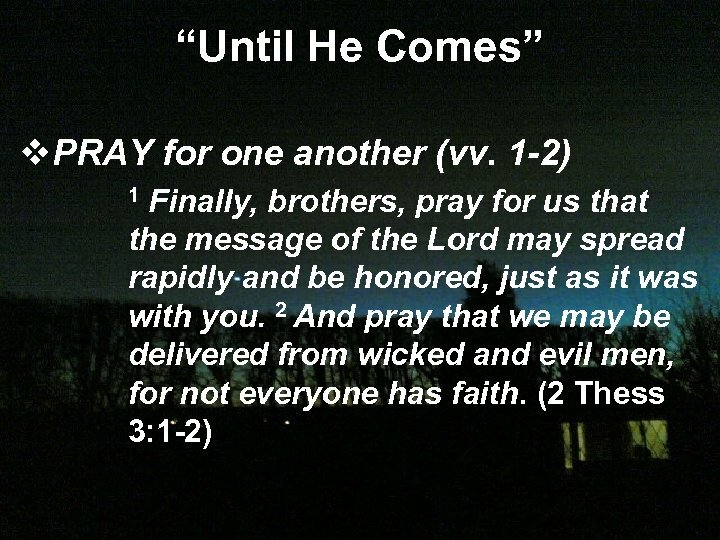 Pray for the protection of others. 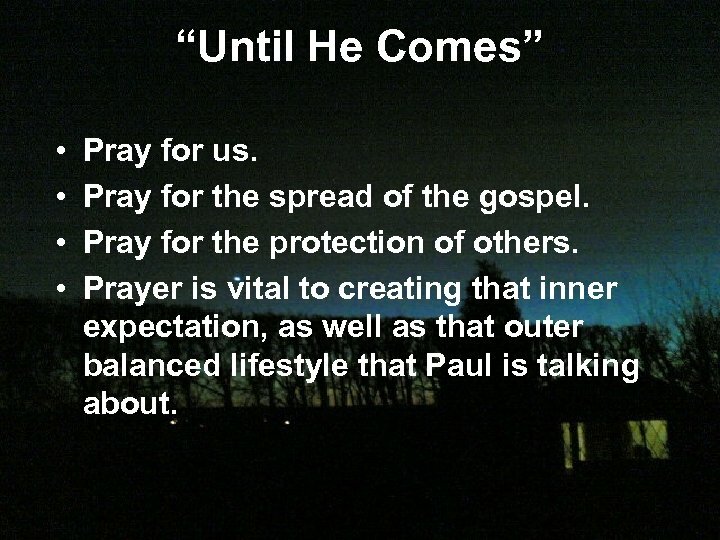 Prayer is vital to creating that inner expectation, as well as that outer balanced lifestyle that Paul is talking about. 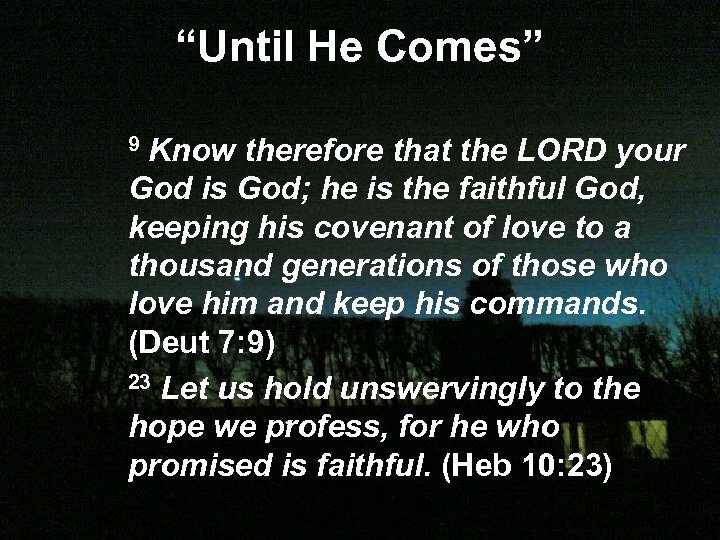 “Until He Comes” • If God’s faithfulness is taken out of the picture, is there any way for us to succeed in the Christian life? NO! 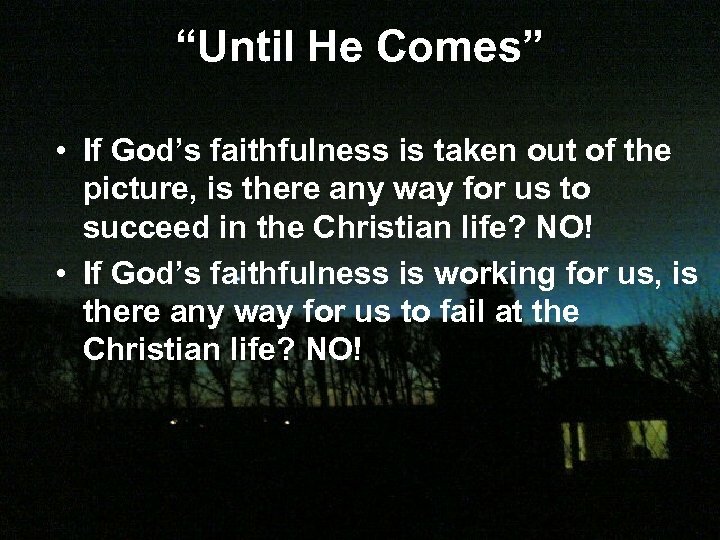 • If God’s faithfulness is working for us, is there any way for us to fail at the Christian life? NO! 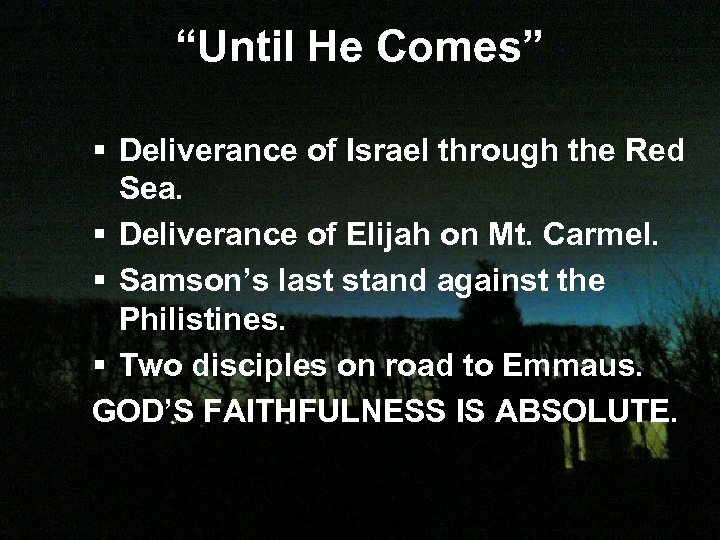 “Until He Comes” § Deliverance of Israel through the Red Sea. 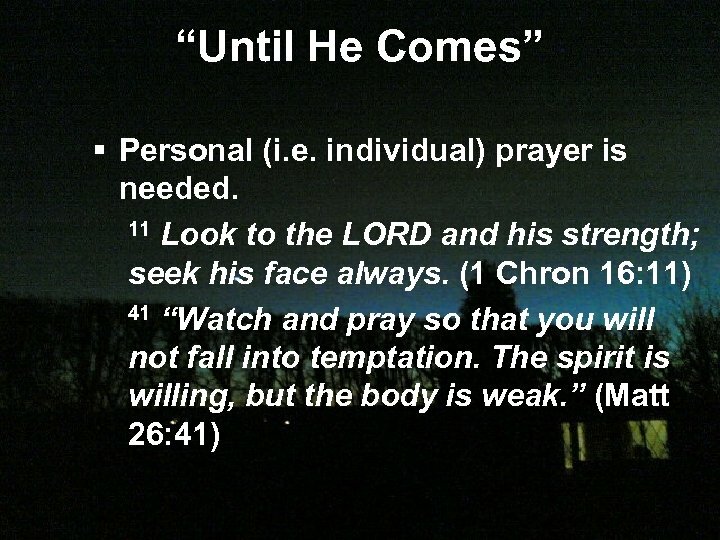 § Deliverance of Elijah on Mt. Carmel. 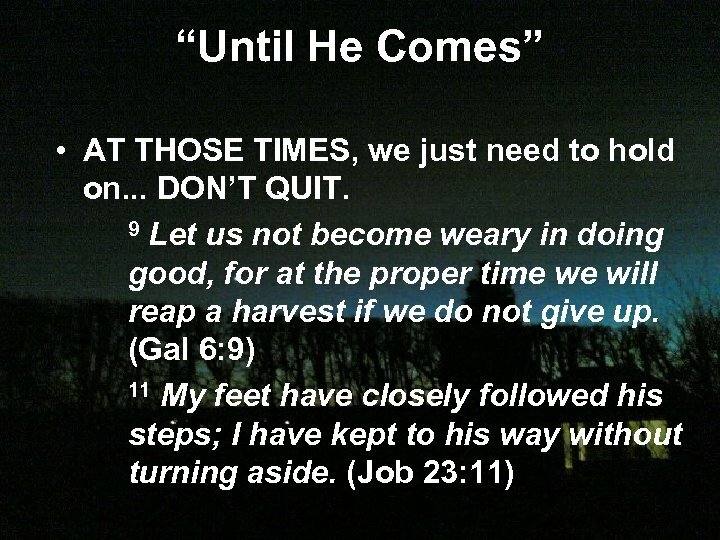 § Samson’s last stand against the Philistines. 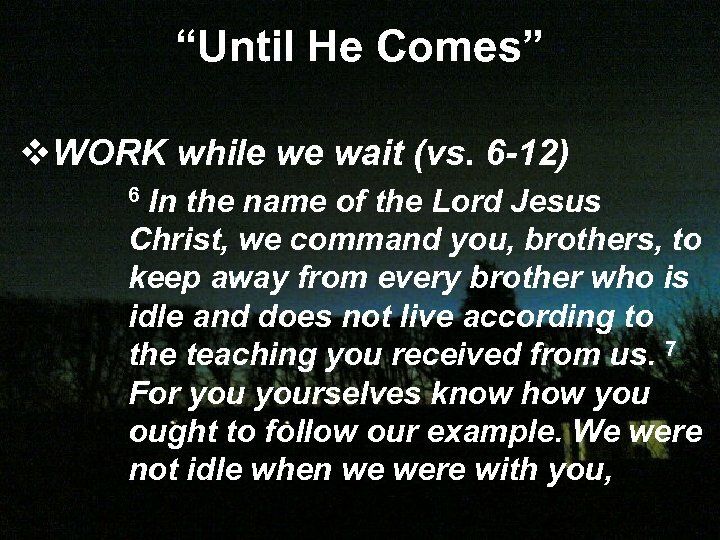 § Two disciples on road to Emmaus. 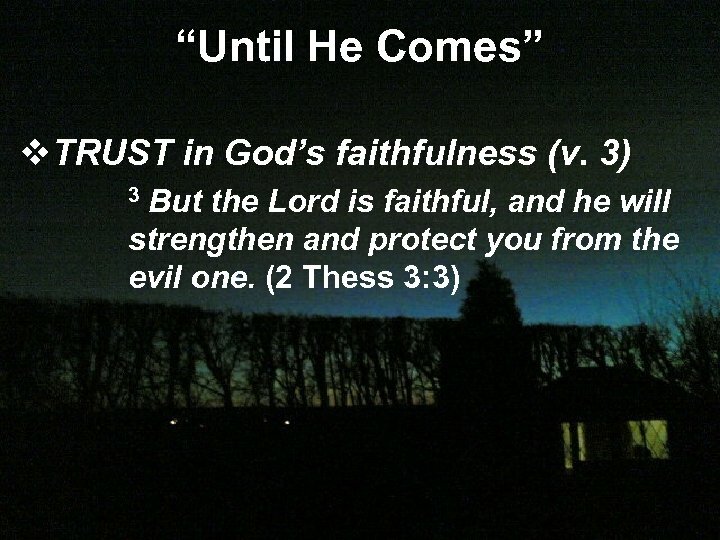 GOD’S FAITHFULNESS IS ABSOLUTE. 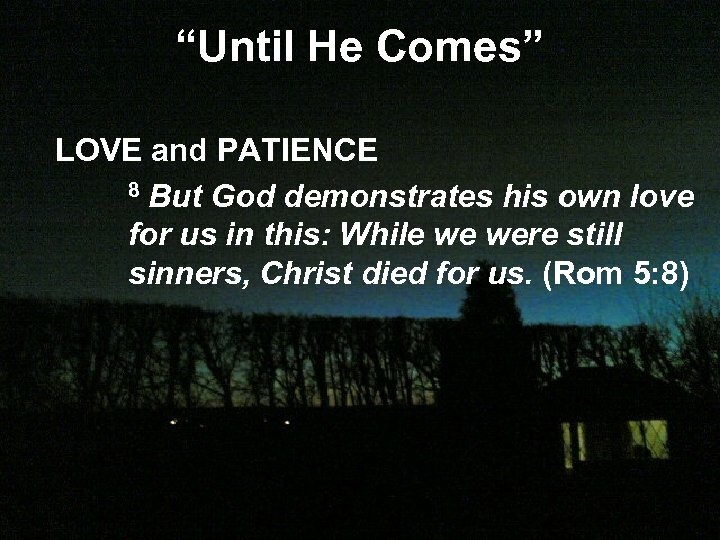 “Until He Comes” v. LEARN love and patience (v. 5) 5 May the Lord direct your hearts into God’s love and Christ’s perseverance. 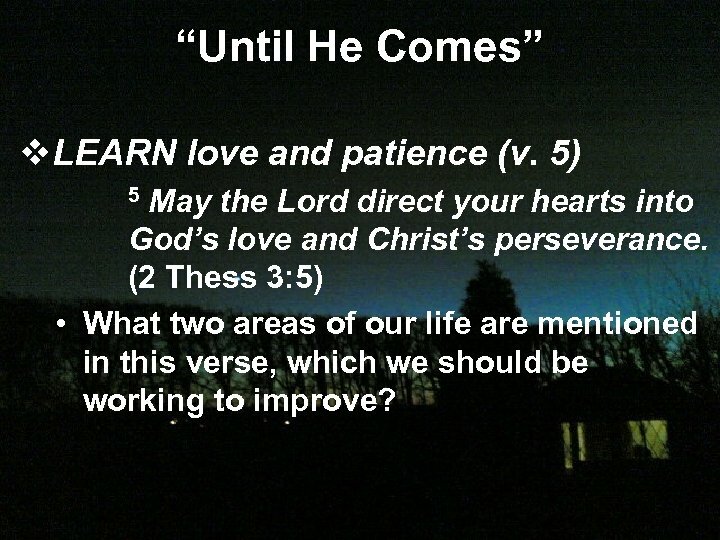 (2 Thess 3: 5) • What two areas of our life are mentioned in this verse, which we should be working to improve? 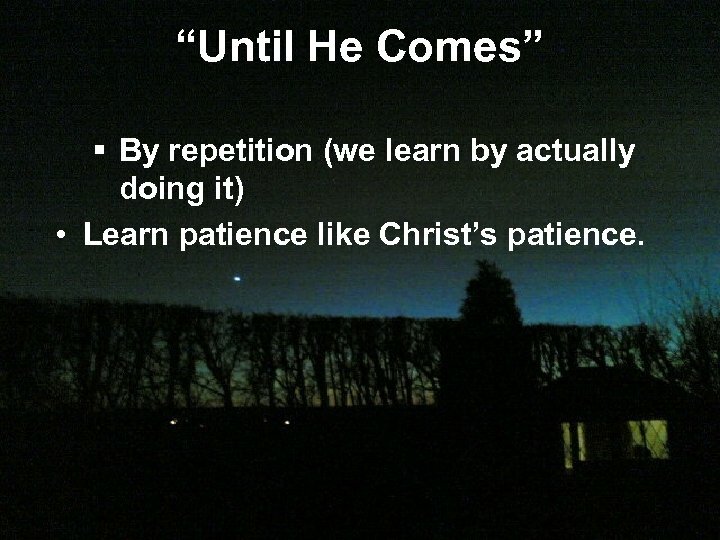 “Until He Comes” § By repetition (we learn by actually doing it) • Learn patience like Christ’s patience. 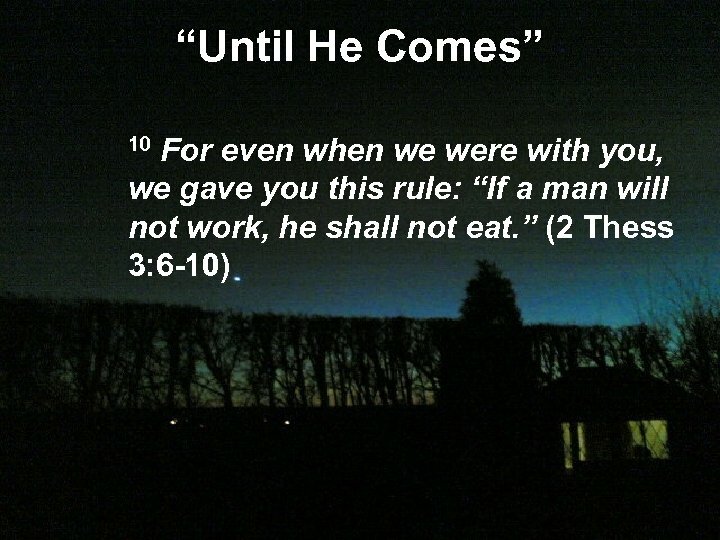 “Until He Comes” 8 nor did we eat anyone’s food without paying for it. 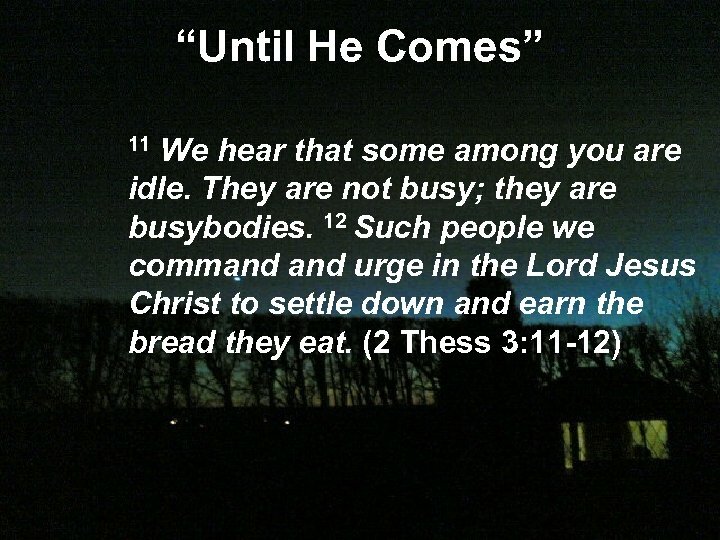 On the contrary, we worked night and day, laboring and toiling so that we would not be a burden to any of you. 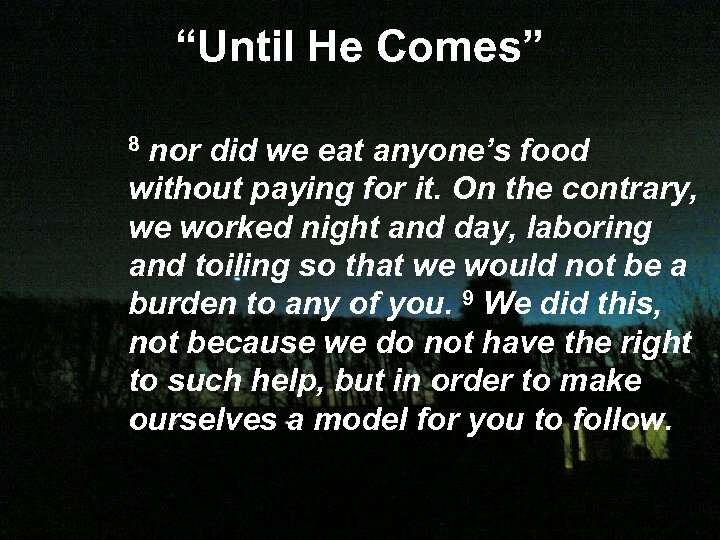 9 We did this, not because we do not have the right to such help, but in order to make ourselves a model for you to follow. 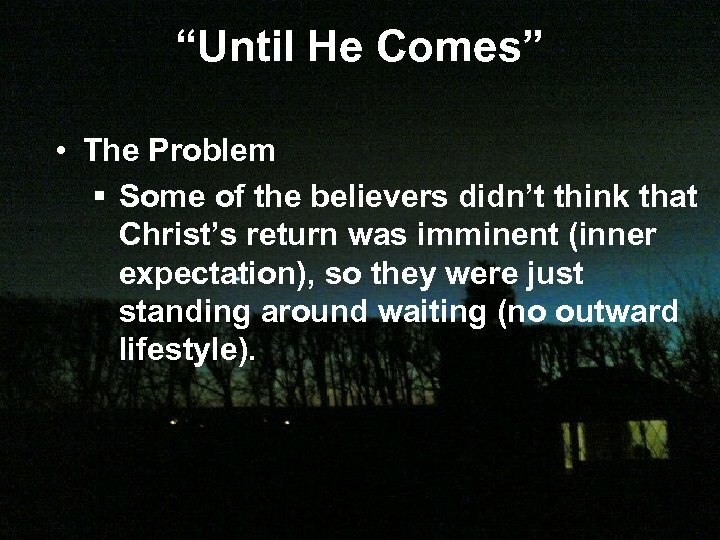 “Until He Comes” • The Problem § Some of the believers didn’t think that Christ’s return was imminent (inner expectation), so they were just standing around waiting (no outward lifestyle). 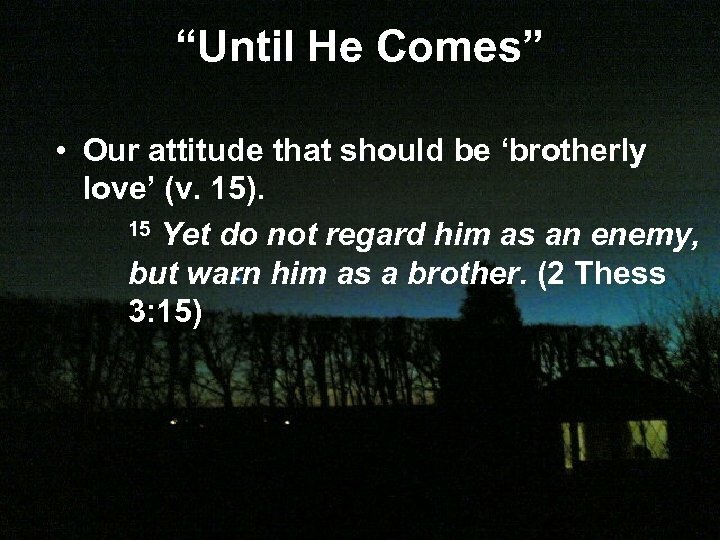 “Until He Comes” • The cause for such thinking. 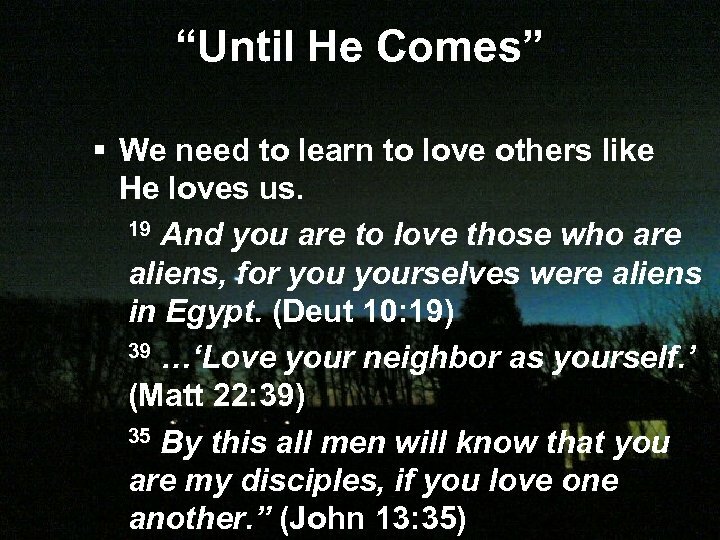 • Correction for the problem. 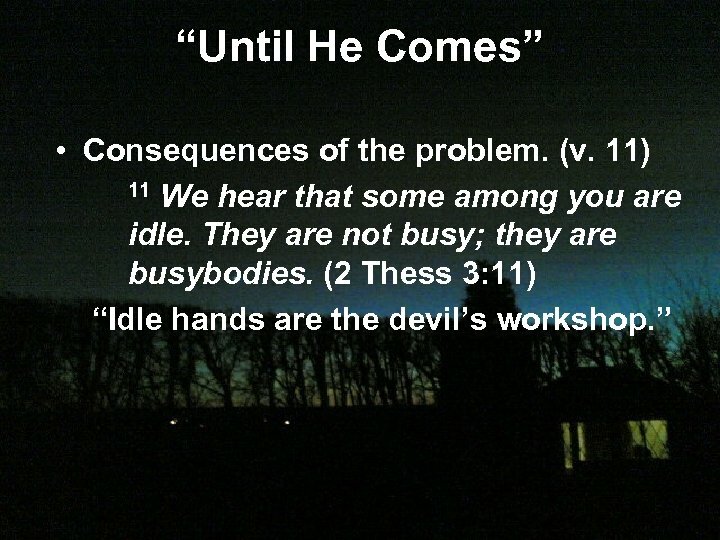 § They were to get to work (v. 12). 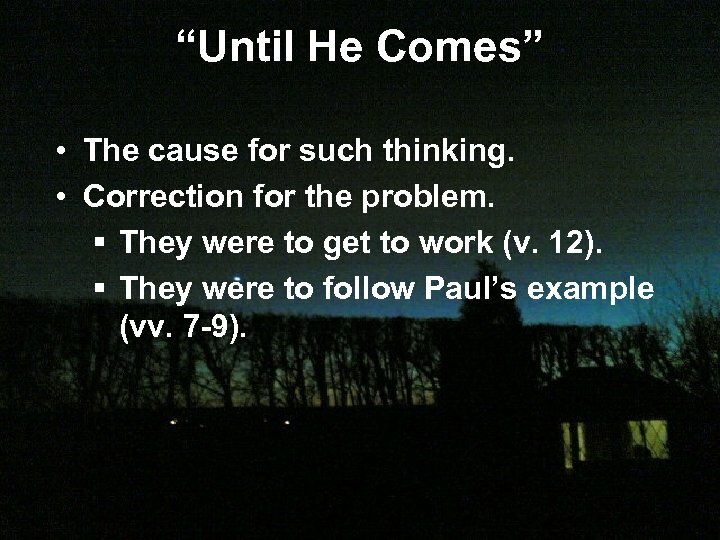 § They were to follow Paul’s example (vv. 7 -9). 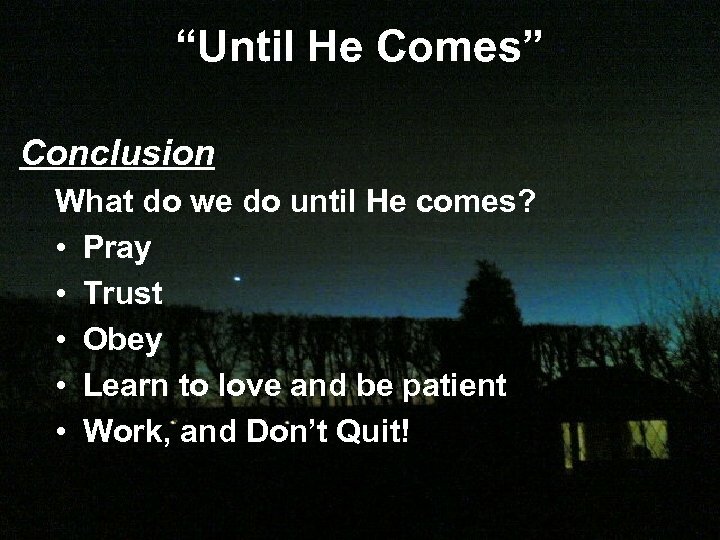 “Until He Comes” Conclusion What do we do until He comes? 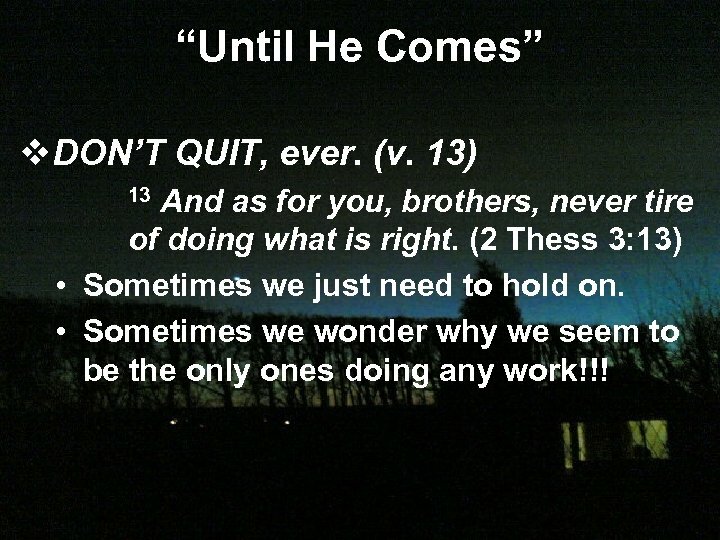 • Pray • Trust • Obey • Learn to love and be patient • Work, and Don’t Quit! Автор Е. В. Емельянова, I кв. категория.